Considerate Parking: What’s it all About? Dropped kerbs. We’ve all seen them. We’ve probably all used them. Yet, unless you use them on a regular basis, you’ve probably never realised just how essential they are. Here at Accessible News, we are determined to raise awareness of this all-too-common access issue and we need your help! 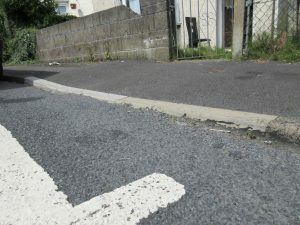 Dropped kerbs make a safer journey for all. From wheelchair users to parents with prams, dropped kerbs allow pedestrians to access the pavement safely and, in turn, enter shops, restaurants, schools, workplaces and even their own homes. For people with disabilities, these dropped kerbs are the only means of safely navigating streets and avoiding oncoming traffic. Without them, getting to work or travelling around town is not only difficult but often dangerous. Yet people continue to park on these dropped kerbs, forgetting just how vital they are. Maybe you’ve done it yourself without even realising. Most people who park over dropped kerbs don’t do so maliciously. Many of us aren’t aware of the risk even the shortest of stays can cause to someone with a disability. 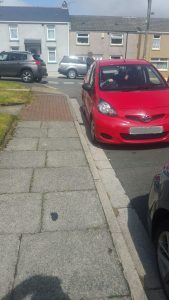 Parking over a dropped kerb for a few minutes may not seem to cause a major issue, but it can often result in people with mobility difficulties having to travel on busy roads or find alternative, hazardous routes to access the pavement. We want to remind people of the purpose of dropped kerbs and encourage considerate parking whenever possible. That is why we’re reaching out to you, the public. We want to hear your stories. Whether you live locally or further afield, this is a nationwide issue that desperately needs attention so, help us spread the word. By getting involved, you could help make daily access less dangerous for people with disabilities across Wales and even the UK. Get in touch via social media or through the contact details provided below, and, whatever you do, please park considerately!